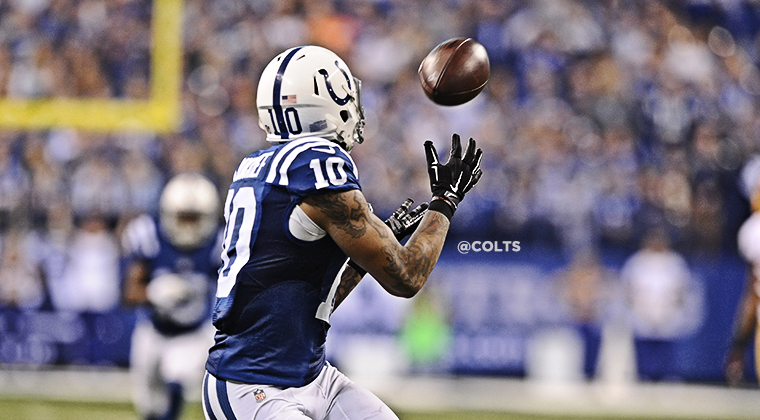 This week’s “Back-Up of the Game” presented by Venyu is wide receiver Donte Moncrief. As the Colts continue to search for playmakers down the stretch, it’s the youngest man in the skill group once again shining. On Sunday, there was Donte Moncrief finding himself behind the Washington secondary for two massive touchdowns. Sunday marked the second 100-yard game of Moncrief’s rookie season. The snap counts for Moncrief continue to rise and his impact on the game is seen in virtually every touch he gets. His 79-yard touchdown in the fourth quarter marked the longest throw of Andrew Luck’s career. Ever since Moncrief began to flash this offseason, the question was where would the then 20-year old get playing time. In a deep wide receiver group, Moncrief has showed that he’s too good to keep on the sideline. “It’s fun, man, just playing with these guys. All of these guys are great guys, learning from Reggie Wayne, T.Y. Hilton and Hakeem (Nicks),” Moncrief said after his second 100-yard receiving day.